You'll be £4.99 closer to your next £10.00 credit when you purchase Mud and Bodies. What's this? Neil Weir died in 1967, but it was not until 2009 that his grandson, Mike Burns, discovered his diary and letters among some packing trunks he had been left, and learnt that his grandfather had served as an officer in the 10th Battalion Argyll and Sutherland Highlanders for much of the First World War. A captain and company commander at the tender age of nineteen, he fought at Loos, Ypres, Vimy Ridge, Ploegstreert and the Somme. At Ploegsteert Wood, Weir's sector contained one of the largest mines ever dug under the German trenches and here the sister battalion he fought alongside was commanded by Winston Churchill. At Vimy Ridge he was with General Furse where a dud 18lb shell landed at their feet and on the Somme, he was recommended for a D.S.O. and mentioned in Despatches for his role in the attack on Longueval in July 1916 which General Haig called 'the best day we have had in this War'. This was where the troops took up their jump-off positions at night, guided by tape laid out in 'no man's land', and, protected by an early use of a 'creeping' artillery barrage, they advanced towards the German front line. Badly injured in the trenches later that year, Weir went on to train other young officers for the War, and then worked at the War Office in Whitehall where he went on into the section that dealt with the British intervention in the Russian Civil War. In the diary, and the numerous accompanying letters, we hear the authentic voice of a First World War soldier and get an insight into his experiences on the Western Front and elsewhere. This book is one of the most fascinating and personal accounts ever published of the First World War as experienced by the men who fought it. As featured in the Western Daily Press and Mendip Times. It is quite special gift that a man left a diary letters of his experiences during the Great War. Not all who have relatives who served in the Great War have such a family treasure trove. It is also such a treasure to any family that his grandson finds letters among packing trunks, ad discovers his war story as an officer in the 10th Argyll and Sutherland Highlanders for much of the Great War. 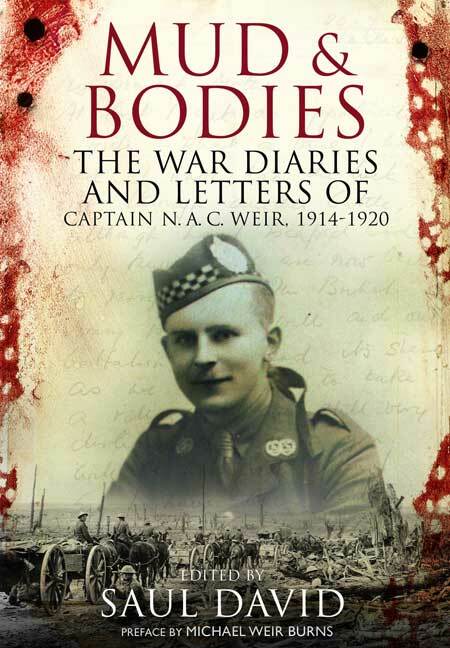 Captain Neil Weir, who passed away in 1967, fought at Loos, Ypres, Vimy Ridge, Ploegstreert and the Somme. His diary and letters gives the reader a real voice of the First World War soldiers as he experienced it. The book is fascinating as a personal account of the First World War, and the men who fought it....There many striking photographs included throughout , both personal and wider. These include photo images of his diary, and photographs of Weir with fellow officers. Overall, this is a wonderful personal account of war. Neil Weir was an officer in the 10th Battalion Argyll & Sutherland Highlanders who was commissioned in 1914 and served on the Western Front from mid-1915. He died in 1967 but his material was left to a grandson who brought this book together with the help of military historian Saul David. As part of the 9th Division Weir fought in the Festubert sector before taking part in the Battle of Loos; his account of the bitter fighting at the Hohenzollern Redoubt in September 1915 is excellent. The expert hand of Saul David in putting the work into context is most welcome and the inclusion of photographs makes this an excellent addition to the new memoirs of the Great War being published for the WW1 Centenary. The book can be purchased from the publishers website: Pen & Sword Front Line Books. Neil Weir never spoke to his family about his experiences in the hell of the First World War trenches, but thanks to newly discovered diaries, his voice is now being heard. A fine account of the life of a junior officer during the First World War. Saul David is Professor of War Studies at the University of Buckingham and the author of several critically acclaimed history books, including Zulu: The Heroism and Tragedy of the Zulu War of 1879, Victoria’s Wars: The Rise of Empire and All The King's Men: The British Soldier from the Restoration to Waterloo. In 2012 he presented ‘Bullets, Boots and Bandages’, a three-part TV series for BBC4 on the history of military logistics.